Once you upload your content, Vitrium encrypts it with military-grade encryption and generates two output file formats including Secure Web link and Protected PDF. The protection remains with your file no matter where it goes. 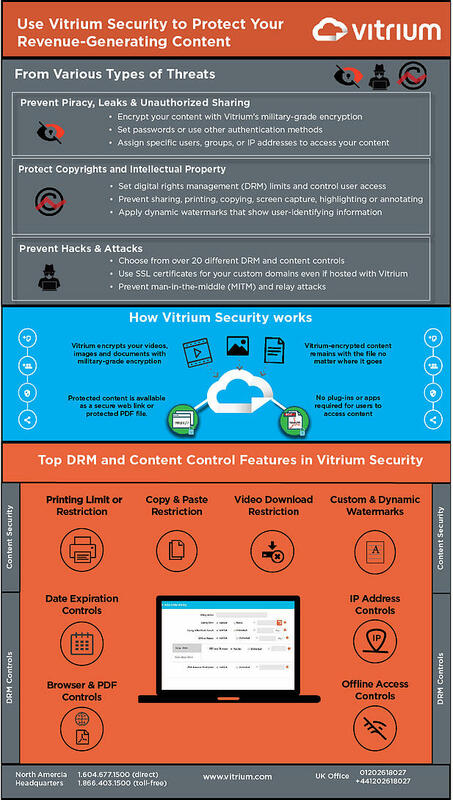 Vitrium’s content security empowers you to restrict and limit video downloads, printing, copying and pasting, and also allows you to apply dynamic watermarks. With Vitrium’s DRM settings you are able to set expiration date, browser limit, IP address and offline access limit.